Of the approximately 4 million births in the United States each year, at least 400,000 of them still trigger a state of desperation in maternity wards. Parents, doctors and medical staff feel this way over the challenge of managing high-risk pregnancies. There is a surprising lack of precise science behind diagnosing risk for preterm birth, or intervening at the right time or with the right methodology. Even worse, U.S. preterm birth rates have actually increased in recent years to almost 10 percent, and along with them a surge of long-term medical and social distress for families. Against this backdrop, the Morgridge Institute for Research is launching a research project intended to give doctors new tools to improve health outcomes and lower premature birth rates. The project includes partners at the University of Wisconsin-Madison Department of Medical Physics, Intermountain Healthcare in Utah, Columbia University and the Meriter Hospital Birthing Center in Madison. 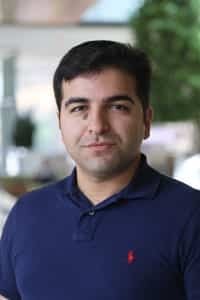 The project, led by Morgridge postdoctoral researcher Kayvan Samimi, will use samples provided by Meriter Birthing Center medical staff of placental tissue normally discarded after birth from 50 pregnancies from different circumstances, including full-term birth and preterm vaginal and cesaerian deliveries. Researchers will then use novel imaging tools to examine differences in the structural properties of those tissues to better understand what goes awry during preterm labor. Samimi says there is strong reason to believe the lower uterine segment, which includes the placental membrane and cervix, plays a prominent role in triggering spontaneous preterm labor. He will be looking for microstructural clues that promote normal versus abnormal weakening in preparation for delivery of the fetus. The first objective will be to visually identify and understand the conditions that pose the greatest risks in pregnancy. The second goal is to develop actual imaging tools doctors can use with women early in pregnancy to identify those risk factors and provide personalized solutions. The key technologies in use are optical coherence tomography and ultrasound. “If successful, the technologies we’re using could easily lend themselves to non-invasive imaging in patients to find these microstructural features,” he says. The catalyst behind the project is Dr. Helen Feltovich, an obstetrician at Intermountain Healthcare in Utah who specializes in high-risk pregnancies and works with hundreds of patients annually. She says her frustration over the problem led her to become an “accidental researcher” and team up a decade ago with UW-Madison medical physics professor Tim Hall. Dr. Feltovich, also on the UW-Madison medical physics faculty, and Hall have partnered on some promising work that focuses on another tell-tale sign of preterm risk, which are changes in the stiffness of the cervix. They are working with ultrasound to identify better objective measures of a level of softness in the cervix that can be a precursor to the problem. The cervix naturally softens before full-term birth to ease passage through the birth canal, but it happens quickly and unexpectedly in preterm cases. Today, Hall says, doctors determine cervical stiffness with a touch test by comparing it to touching one’s forehead (firm), nose (medium) or cheek (soft). It’s not the only low-tech approach. Dr. Feltovich notes that there are only three available interventions today for preterm risk. The first is a pessary, or a small device inserted to provide support for the cervix, which isn’t approved by the Food and Drug Administration. The second is cerclage, a stitch around the cervix that was first adopted in 1902 and is essentially unimproved today. The third is a progesterone hormone therapy that is intended to stabilize the pregnancy. “These treatments have been recycled over and over … and there probably is a very small number of people for whom they actually work,” she says. The relative absence of rigorous science is contrasted by the problem itself. Feltovich says doctors were astonished to see preterm birth numbers climb in the United States in 2015 and 2016 up to 9.8 percent after a period of modest decline. It turns out they only declined, she says, in large part because of more accurate gestational dating and fewer elected inductions by caregivers. Preterm births — which occur between 20 and 36 weeks of pregnancy — result in babies not fully developed and can lead to health problems including cerebral palsy and learning disabilities. The Institute of Medicine estimates that preterm birth costs an estimated $26.2 billion annually in increased health and social services. The Morgridge project is also unique in that it’s cutting across silos in current research. In addition to Samimi’s project on membranes and the Hall/Feltovich work on the cervix, the team is joining forces with a Columbia University project that will use all of the information to model the biomechanics of high-risk pregnancy. The Meriter Birth Center staff response to the project has been very enthusiastic, says Melissa Skala, a Morgridge medical engineering investigator who is overseeing the project. “They’re really excited to learn about what’s happening with their patients, because they’re frustrated,” she says. Skala says the project is a prime example of how the Morgridge Institute can help seed risk-reward research that may be too early-stage to get funding from the National Institutes of Health. Samimi was hired under an interdisciplinary postdoc program created by Morgridge to delve into this kind of uncharted territory with UW-Madison partners. A story on the preterm birth project by David Wahlberg with the Wisconsin State Journal on Oct. 15 was later distributed nationally by the Associated Press, resulting in more than 60 placements.